The Capability Voucher Funding helps business owners to access business training and coaching services, by providing them with up to 50% subsidy towards the registered service cost. The funding is one of the services available through the network of 14 Regional Business Partners who employ Growth Advisors to support business owners looking to grow and innovate. To access this co-funding you must first meet with one of our RBP Growth Advisors to discuss your business. The Growth Advisor will seek to understand opportunities for growth and help identify any barriers to this. The Growth Advisor will then work with you to put together an action plan. 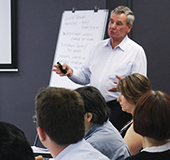 Where there is a management capability need identified that could be addressed by undertaking training, the Growth Advisor may issue a Capability Voucher to the business. Have fewer than 50 full time employees. Are operating in a commercial environment. Are a privately owned business, or are a Māori Trust or incorporation under the Te Ture Whenua Māori Act 1993 or similar organisation managing Maori assets under multiple ownership. Vouchers may be used to help pay up to 50 percent of the cost of services (up to a maximum value of $5,000 excluding GST) from registered providers that improve management capabilities. More information on the Regional Business Partners can be seen here. What areas can I get funding for? Meet with a RBP Growth Advisor to assess the level of management capability and to identify any training or coaching needs. Below is the list of Business Central Courses that have qualified for the NZTE Capability Development Voucher Scheme. Please enter your voucher details when making your booking. We will verify your voucher with the issuing Regional Business Partner before confirming your place on the course.